My most successful publication is not an academic work but a book I co-authored (published in 1996) entitled The Art of Swimming. It has sold over 20,000 copies, more than ten times the number of my academic book sales. I developed a fear of water when a well-meaning primary school teacher threw me into a swimming-pool. At school (Eton) a list of ‘non-nants’ was circulated to house notice-boards at the beginning of every term. I was bullied by a senior boy in my House, who forced me to take a termly swimming test: he would push me fully-clothed into the freezing outdoor pool, and I would be fished out with a pole. Subsequently the school made efforts to teach non-swimmers, without success. My own further attempts to learn swimming failed. I reached a stage where I could thrash through the water holding my head above the surface, but I was resigned to the idea that water was not my medium; on holidays even in the hottest climates I avoided the sea and swimming-pools. When I studied at music college in the late 1970s, it was common to take lessons in the Alexander Technique, a system of bodily reorientation that helps performers remain poised under pressure. At the age of 34 I saw two small ads pinned up in my local gym: Steven Shaw was advertising Alexander Technique lessons on one and Swimming Lessons on the other. I made immediate mental connections: inability to swim could surely be related to the issues that the Alexander Technique helps to alleviate. Shaw, a former competitive swimmer, was a fine swimming-teacher, and with him I soon learned to enjoy water in the unthreatening environment of a warm, clean, shallow pool, with one-to-one attention from a teacher standing by me. I learned to swim well in the space of a few weeks, and went on to get an ASA qualification so that I could give swimming lessons. I decided to write a book structured around the issues that had blocked me from swimming for years, and which had been resolved by processes central to the Alexander Technique — issues of confidence, breathing, bodily reorientation, direction of attention, coordination of actions, and being in the moment rather than striving to ‘end-gain’. Steven Shaw brought his professional perspective to my thoughts as a first-time adult swimmer. 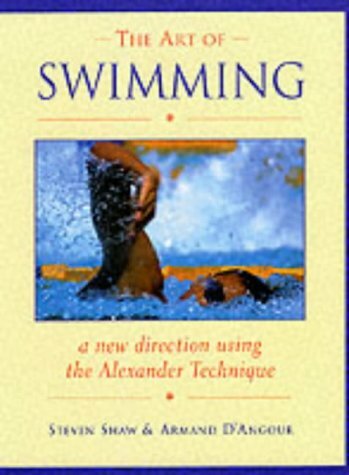 The Art of Swimming: a new direction with the Alexander Technique (Ashgrove Press 1996) has been through 3 editions and numerous reprintings, and has helped the Shaw Method — the name I urged Steven to use for his business — grow into a successful international swimming organisation. I now swim regularly, and often observe many swimmers thrashing up and down a pool as I used to — with their heads out of the water, straining their back and neck, and failing to enjoy the pleasures of water. For poor swimmers and aquaphobes such as I was, our book advertises that developing good habits in the water is well worth the effort.